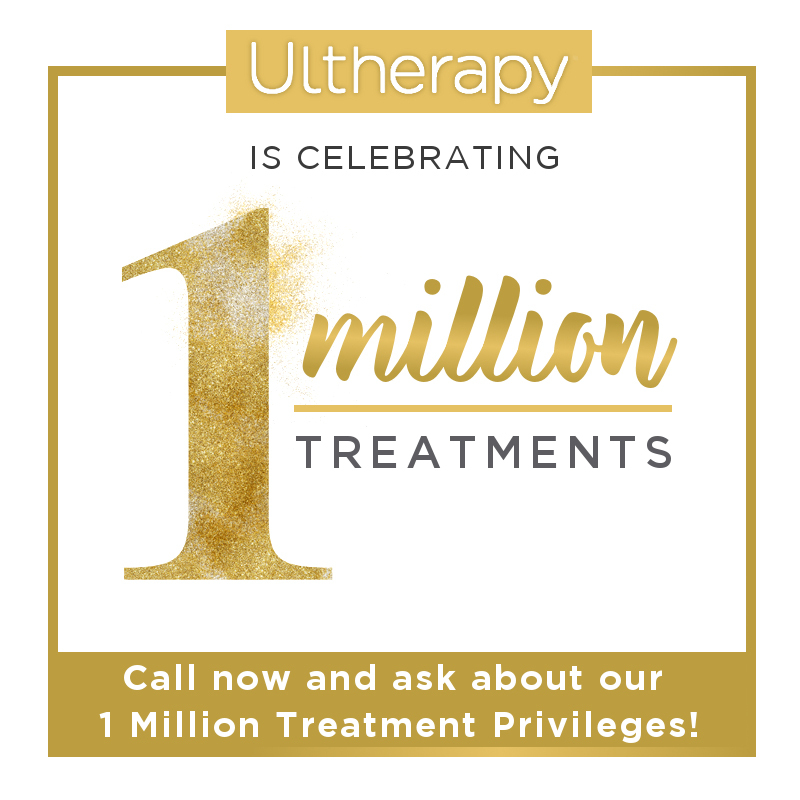 Home / Body / Ultherapy Celebrates 1 Million Treatments – and Counting! Ultherapy, the non-invasive face lift, celebrates a monumental milestone by having one million treatments done worldwide. For men and women with aging skin, Ultherapy is an effective method for turning back time in a way that’s safe, proven and requires no prep or recovery time. Best of all, the results look natural. The ultrasound treatment works from the inside-out by gradually stimulating deep structural support layers in the skin to grow new collagen over a period of two to three months. Results can continue to improve up to six months following the procedure. Learn more about Ultherapy and why it has been successfully used on more than one million people since its inception to the skincare industry in 2010. Ultherapy is truly a unique skin tightening treatment. It has been FDA-approved to actually lift skin to give results similar to a facelift without the incisions or sutures. While Ultherapy can’t yet duplicate the profound results of facelift, it is a popular option for those who are not yet ready for surgery or patients who desire a more subtle and natural cosmetic improvement. Ultherapy is the only cosmetic procedure to currently use precise ultrasound imaging technology to improve the elasticity and texture of the skin. Ultrasound imaging is what allows the practitioner to see the tissue layers during treatment to ensure that energy is being deposited in the areas most beneficial to the patient. This wrinkle treatment in Singapore can vary in length depending on your unique treatment plan and the area being treated. For saggy skin on the face or neck, expect an average treatment time of 60 to 90 minutes. If you’re covering an area like the chest, treatment time is generally 30 minutes. After your Ultherapy treatment, there is no downtime and you can resume your normal activities immediately. There are no post-treatment procedures to follow making recovery a breeze. Many people worry about the pain or discomfort of cosmetic surgery. Fortunately, Ultherapy is different than more invasive procedures. The wrinkle treatment is well tolerated by most patients and feels like tiny pricks of electricity. As the ultrasound treatment is being delivered, small amounts of energy are deposited at specific depths into your skin to initiate the collagen-building procedure. While comfort levels vary from patient to patient, the sensation only lasts during the treatment itself. Most patients require just one treatment of Ultherapy to tighten loose jowls or forehead lines. However, more than one treatment may be needed depending on the severity of the skin laxity and the individual’s biological response to the ultrasound treatment. As the skin continues to age, you may also need to undergo touch-up skin tightening treatments in the future to maintain your results. Ultrasound energy has been safely used for more than 50 years in the medical field. Skin tightening in Singapore is an affordable way to create a more youthful complexion without the need for complex and dangerous surgeries. At Cutis Laser Clinics, Ultherapy is done by our experienced and US Board Certified skin specialist Dr. Sylvia Ramirez. To know if you are a good candidate for Ultherapy skin tightening, please contact Cutis Laser Clinics today.